Big Up to Delusions of Adequacy for typing such nice things about Coin Under Tongue's Reception into an html document, and then uploading said document to a server where people from around the world can access it by way of any number of compliant browsers. " 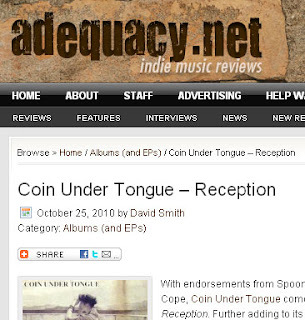 With endorsements from Spoon’s Britt Daniel and the legendary Julian Cope, Coin Under Tongue comes with a promise to deliver on its new album Reception. Further adding to its pedigree, the album is released by Death By Audio — the home of A Place To Bury Strangers’ Oliver Ackermann. 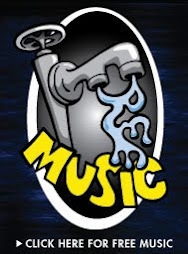 So, what’s the music like? 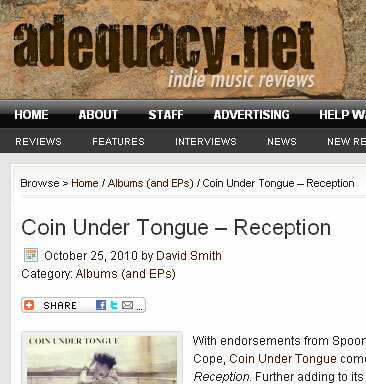 If you remember the band Swell, you’ve got a head start on understanding the sound of Coin Under Tongue. As a reference point, both bands trade on sharp lyrics and a veering between stripped-down and amped-up compositions. Coin Under Tongue, though, gets heavier than Swell ever did, throwing in some really fuzzed-out guitar and bass (“Night Weed,” “Beyond Yes”) and throwback riffing. “Beyond Yes” does a little ransacking of Mudhoney’s playbook when it wants to make its points. On “Junksmith,” the opening measures of feedback and subsequent guitar work show the influence of Ackermann’s approach to electric guitar. What’s curious about Coin Under Tongue’s sound is the way the drums sound thin and rough. Bands usually go for a sonic aesthetic and apply it equally to all instruments, but here the guitars sound like they’re played in an aircraft hangar while the drums sound like they were recorded in someone’s basement. The title track “Reception” seems to have to do with a wedding reception at first, but with a line like “Coming through loud and clear,” it might be that the band is playing with a double meaning here (as in “receiving” a signal). The caterwauling vocals and guitars infuse this one with a menacing aspect that makes it anything but the genteel affair usually connoted by weddings generally. “Seizure In The Stairwell” goes for unadorned, Waits-/Swell-like tunesmithing but there’s a low, rumbling presence lurking in the background. On the opposite end of the spectrum is the Liars-like aggro experimentalism of “Conflicted,” whose nearly tuneless bursts of noise and screamed singing show the band’s raw side. There’s a decent amount of unusual pairing of musical styles on this album, and if it weren’t for the band’s competent melding of these styles it might come off as accidental or unfocused. How many bands would’ve or could’ve penned a cut like “Dogma Sheen,” where an 80s-style guitar intro (repeated during bridges) turns into a grimy, sludge-covered wall of noise? Not many, really, not many." - thanks David!